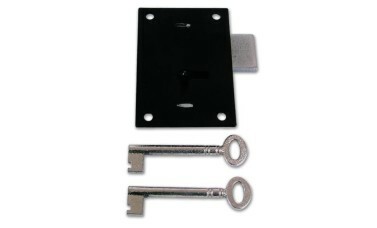 The Asec 1 lever Straight Cupboard lock work off the same key so if you order 2 they will both function from the same key. Asec cupboard locks are the budget range of cupboard locks they are good value.Operation Deadbolt is locked or unlocked by key. The Asec 1 lever Straight Cupboard lock work off the same key so if you order 2 they will both function from the same key. 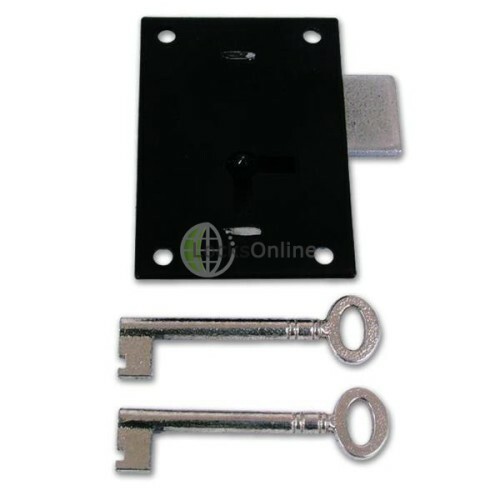 Asec cupboard locks are the budget range of cupboard locks they are good value. Hi, guys. My name is Darrel, and I'm head of the tech team here at LocksOnline.co.uk. Thanks for taking some time to tune in and have a look at one of my product and review videos. 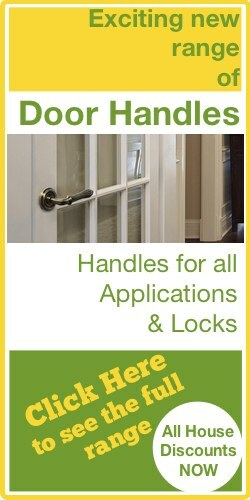 Today we are talking about some cupboard or cabinet locks etc. It's the Asec. It's the one-lever cabinet locks that you can use on cabinets of course and other forms of small types of cupboards and the hatches and latches and little doors, etc., like wardrobe doors or whatever you want to use them on. They come in three different sizes. The one that I have here in front of me is the 100-millimetre size. But they also come in 75, and they also come in 89 millimetre as well should you want one that's a little bit smaller. So let's get the actual product out and let's have a look at it in a little bit more detail. It's called a straight cupboard lock and the reason for that is because it physically gets screwed onto the back of whatever the door that you're planning on wanting to fit it into. All right, so it would actually, the back of it which you can see would actually project out of the back of the door. Now, there's no need for handing on these because they can fit on either handing because as you put the key in and as you actually turn the key-of course if the door was opening that way, you'd have it on that lock and vice versa. So it's entirely up to you. One thing you would also realize as well is that you can either have it in the horizontal shoot like that because the keyhole sits down or you could turn it so you can have it on a vertical shoot because the keyhole also sticks down there as well. So it gives you great diversity in regards to how you would actually fit it onto the cabinet or the cupboard that you fancy on locking. Now, one lever is not the most secure. We can get up the four-lever. So you must treat this as a bit of passive security. There are better security related products if the manipulation of the lock is what you need to be considering yourself with. But they are built out of steel as you can. They are painted in a black finish, and of course the bolt as well is made out of a piece of steel. So it's a relatively strong construction in that respect anyway. Now, what you will also find is that if I was to put that in there, the amount of thickness of the actual substrate is quite a lot as well. So one thing people ask us quite a bit is how thick can the door be before you start losing the key? And I would say comfortably there, you can get up to around about 35 millimetres. Thirty-five millimetres is going to get you above there. So you've still got a little bit there to put your key into. But probably 30 or around about there will better. Yeah, that's around about 30 millimetres. So anything less than 30 millimetres in regards to thickness of the door, you'll be fine with this particular type of lock. It comes as standard with two keys as you can see here and to measure it, I got the biggest one here. It's the height, is what you're measuring in regards to the physical size. So in this respect there you've got the height there at 100 millimetres as you can see there. The case depth is 55 millimetres as you can see there. Okay, the backset, and that's from there to the leading edge in that respect there, should be half, which it is. It's 25 millimetres because this obviously sits in the centre. So the backset from the leading edge to the door to where you're going to have your keyhole is 25 millimetres. The actual thickness of the actual neck in its entirety, if I just get my Vernier, I can do it with a Vernier quite quickly and that there is 12. It's right about just over the 12 millimetres thick. So there you go guys. There's not much more that I can say about them other than obviously that they are available on our website. But listen, if you need a bit more information or you want a bit more advice, by all means, pop online, use our live chat on our website. If you want to, give us a call or pop us over an email. We'd love to hear from you and more importantly we'd love to see you as a customer. So from me, Darrel, and all of us here at the LocksOnline team, thanks for tuning in and we'll catch up with you real soon. Bye-bye now.